Historically, children who participate in gymnastics classes or activities have benefitted physically, mentally and emotionally. Regardless of their age or initial comfort with group-based sessions, young gymnasts build valuable social skills while also fostering the habits they need to live active, healthy lives. With the average child spending seven hours a day looking at screens, the importance of putting youngsters in a program that makes physical fitness and interpersonal communication a priority is crucial for their continued development. As they inch closer to their teenage years, prioritizing physical activity and social interactions with other kids their age will put them in a great position to blossom into strong, capable young adults. As of 2016, the childhood obesity rate in the United States is the highest it’s ever been. With 18.4% of 6-to-11-year-olds and 20.6% of 12-to-19-year-olds suffering from obesity, helping our kids adopt a healthy lifestyle is more important than ever before. Thankfully, gymnastics can put youngsters on the path to physical fitness but also promotes a positive learning environment for them. Besides lowering obesity rates in all children who participate in classes or activities, the cardiovascular nature of gymnastics-based exercise can reduce risk of heart disease, diabetes and other serious illnesses. Those who partake in recreational activities like gymnastics also tend to make healthier dieting choices as teens and adults, which lessens the possibility of becoming overweight later in life. The bottom line is that regular participation in any physical activity is important; that said, gymnastics offers a comforting environment that, in most cases, shies away from the uber-competitive and pressurized environments commonly associated with team-based youth sports. The emphasis should be on fun and learning, not take-no-prisoners competition, especially at a young age. Gymnastics doesn’t just benefit children from a physical standpoint – it can improve their mental and emotional wellbeing too. By participating in classes or sessions with other children in their age range, young athletes can also develop the intangible skills they need to deal with challenges and adversity in everyday life. This happens through communication with both their peers and coaches, as well as pushing themselves to get to that next level when pursuing an overall goal. Studies have shown that kids who are active have less trouble falling asleep and get better quality sleep on a regular basis. The benefits of an improved sleep schedule are widespread, ensuring that children are more alert during the day and have a more enriched experience both in and outside of the classroom. Finally, gymnastics can fortify necessary social skills such as listening, following directions, waiting your turn and respecting others around you, both other athletes and coaches and/or a club’s administrative staff. Those capabilities will undoubtedly lead to any number of positive developments for children of all ages. Gymnastics requires lots of concentration and commitment to achieving a goal. Even if your child is partaking in recreational gymnastics, the process of building their skills in the gym demands focus, discipline and perseverance. While that might sound like heavy stuff, that process will benefit them greatly in the long run. Those positive gymnastics experiences will also help active children build confidence and blossom into focused, determined, responsible young adults. Whether it’s at school or at home, kids will exhibit marked improvements in their daily lives, ones that may even rub off on some of their non-gymnastics peers and friends. I hinted at this earlier, but gymnastics helps build and solidify a range of important physical traits in youngsters – ones that become increasingly important as they get older and pursue other, more demanding recreation activities or exercise options. From motor skills to coordination, gymnastics is a fantastic option for parents if they’re looking for their child to acquire a strong base level of physical fitness. In addition to those skills, kids strengthen their balance and sense of body awareness through gymnastics. That emphasis on overall body control can positively influence things like weight control, reduced feelings of stress or anxiety and more. Finally, we have maybe the most admired physical benefit that gymnastics brings to anyone who practices the sport, regardless of age or athletic ability – increased strength. Gymnastics is known as being a recreation activity that helps participants develop an excellent strength-to-weight ratio, especially when you combine that with other aforementioned aspects like balance and coordination.Not only does this help counteract weight struggles in children but it also emphasizes overall muscular strength, flexibility, endurance and power. Beyond that, other positive side effects can include better posture and a toned, lean look. This can be more of a priority for adults than children but, in the grand scheme of things, the more exercise any youngster is exposed to, the more likely they are to hit and stay in peak physical condition for most of their lives. The best gift you can give your child is the tools they need to pursue and maintain a healthy lifestyle. Strong habits built in youth can translate to a lifetime of enjoyment when it comes to physical activity. They can also encourage kids to partake in social activities that stay away from screens and the constant bombardment of apps, games and other digital distractions. 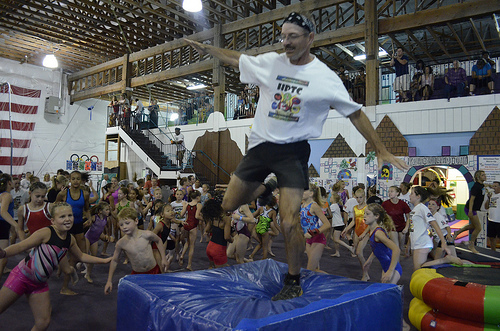 At the end of the day, all of us just want our children to be happy and healthy and gymnastics, as a recreation option for kids who aren’t interested or ready to dip their toes into more competitive fare, can be a perfect way for them to enjoy an active lifestyle that values exercise and its positive impacts on physical, mental and emotional well-being. Alex G. is VP of Marketing and Customer Success at Amilia, a company offering an all-in-one gymnastics registration software solution for gym schools and cheer clubs. His daytime passions include marketing and technology while his after-work passions include good wine and martial arts. With his black belt in judo, Alex applies his focus to growth with as much discipline as he does to armlocks and chokes on the mats. Cognitive Skills: focus, memorization, problem solving, following instructions. Click through to learn more about one of the best Recreational Gymnastics clubs I know. Only 2 years old. Kids should learn their limits, make their mistakes, in a supervised, padded playroom. Not on a bike or jumping from a garage roof. The backward roll is a very difficult skill for beginner gymnasts to learn. Here Christopher Brown from California Sports Centers shows a drill he uses to teach this basic gymnastic skill. The head is disproportionately large relative to the rest of the body in young children. That makes backward rolling significantly more difficult. A child’s “job” is to play. They should be climbing. A lot. But safely. Click PLAY or watch a Special Needs video on YouTube. ALL kids are special. Related series of videos on Special Needs Gymnastics. Browse the Grow Through Movement playlist.